I readily admit that my knowledge of ‘travel writing’ begins and ends with Bill Bryson. So when I learned that In A Strange Room is a road novel grounded in the facts of an actual journey across Africa and India, my interest piqued – maybe it would offer me an easy way into the alien landscapes of travel writing via the comfortingly familiar scenery of narrative fiction. Oh so naive me. Far from the light-hearted reading I had anticipated, In A Strange Room is a challenging, often abstract novel; an experiment in form that defies genre and isn’t troubled by such mitigating concepts as ‘meaning’ or ‘realism’. Its simple, sparse prose hides beneath it a veritable smorgasbord of themes, ideas and questions; never has the description ‘still waters run deep’ rung more true. In A Strange Room comprises three short stories (all previously published in The Paris Review), each of which follows a journey made by Damon, an itinerant South African who simultaneously is and isn’t Damon Galgut the author. The book doesn’t so much blur the boundaries of autobiography and fiction as it does tie them into an indistinguishable knot, hand the knot to the reader and say, with a smug but sad demeanour, ‘good luck untying that one’. There’s a tension between memory and invention that is never resolved; what did happen and what could have happened is the dichotomy that defines this book, and the key relationship is between the writer and his protagonist alter-ego. I suppose it’s fitting, given this duality, that my copy was accidentally double-bound with two dust jackets, instead of one. What is immediately striking about In A Strange Room is its stylised mise-en-page. Each new paragraph is delineated by two blank lines, rather than simple indentation. Similarly, direct speech is double-spaced and printed without speech marks. In essence, this layout is exactly the same as (dare I say ‘inspired by’?) Cormac McCarthy’s The Road; there’s a lot of space on each page – much more paper than there is ink. As well as looking like The Road, it reads like it too; no scene is longer than a single paragraph, and there are several of these on every page. Thus the book consists of hundreds of small sketches of narrative; some scenes offer mere physical descriptions of landscapes, others are short philosophical musings, while some relate brief conversations between Damon and the characters he encounters on his travels; the time lapse between each scene may be minutes, or months. In A Strange Room, then, is characterised by a kind of brevity; you’d be forgiven for believing that the novel is unfinished, a yet-to-be-fleshed-out diary of ideas for some grander project. The actual writing, however, is exceptionally polished and eloquent; the more I read, the more engrossed I became; the novel’s tiny micro-scenes and sparse dialogue – conversations so short they can barely be said to have happened at all – lend great momentum to the book, and it’s easy to read a hundred pages in one sitting, only to find yourself wondering where the time has gone. They say I need a visa. I don’t have one. The guard looks at his passport, looks at him, and beckons him closer. The ‘I’ and the ‘him’ are, in fact, both referring to the same person, and while this strange technique takes some getting used to, it’s ultimately very effective. I assume that where Damon’s memories are vivid, he uses the direct first person ‘I’ to tell his story, and that where he fills in the gaps with fiction, he refers to himself (or rather, the fictional version of himself) with the indirect third person ‘he’. ‘Memory is fiction’ Galgut asserts, and if identity is a dominant theme in the novel, then ‘doubling’ is as well. Every character both is and isn’t Damon Galgut; part remembered and part invented. Galgut himself wallows in a double identity as both writer and self-cast character. Damon is lost and Damon wanders. It’s especially pleasing that the name ‘Damon’ is anagrammatic (a mirror image, even) of the word ‘Nomad’. The world you’re moving through flows into another one inside, nothing stays divided any more, this stands for that, weather for mood, landscape for feeling, every object is a corresponding inner gesture. Jerome, if I can’t make you live in words, it’s not because I don’t remember, no, the opposite is true, you are remembered in me as an endless stirring and turning. But it’s for this precisely that you must forgive me, because in every story of obsession there is only one character, only one plot. I am writing about myself alone, it’s all I know, and for this reason I have always failed in every love. Jerome is Damon’s double; equally as taciturn, yet equally as passionate. In being commited to paper, every character contains more of Damon than of anyone else. In ‘The Follower’ Damon meets and travels with a German man called Reiner. Reiner seems confident, full of purpose and direction; he makes plans and he follows them. He appears to be the antithesis of Damon. But the more Damon remembers about Reiner, the more ambiguous Reiner becomes – he too is revealed to be a man of few words and of dithering self-confidence. He will hardly think of Reiner again, and when he does, it is without regret, there are still times, walking on a country road, alone, when he would not be surprised to see a dark figure in the distance, coming towards him. I can’t say whether I liked In A Strange Room or not. I certainly didn’t dislike it, but more-often-than-not the feeling that I was most struck with was indifference. It’s not your average ‘road novel’, and it’s definitely intriguing and well-written. But it can also be frustrating, too brief and afraid to commit itself emotionally. It’s not about what travel is as much as what travel means; and this combined with a constant struggle between memory and invention makes everything slippery and hard to pin-down. It’s a book that asks a lot but says very little. Don’t go into it expecting lavish and accurate descriptions of Africa and India; travel is merely a narrative framework for a novel of self-examination and introspection. It could cynically be labelled as a vanity project. I’ve found it very easy to read, but very hard to write about. In A Strange Room defies meaning; more than anything, this novel tells us that the world, other people and even ourselves, are all very difficult understand. A journey is a gesture inscribed in space, it vanishes even as it’s made. You go from one place to another place, and onto somewhere else again, and already behind you there is no trace that you were ever there. Things happen once only and are never repeated, never return. 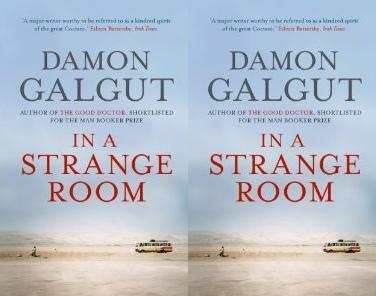 This entry was posted in Novels, Reviews and tagged Booker Prize, Damon Galgut, In a Strange Room. Bookmark the permalink.